Now that he’s done, I’m really happy with this mask. He will be shipped off to Nancy today, and I know I’m going to miss having him around. Harry has such a sweet face. In case you’re wondering, I used the same methods for this mask that you’ll find in the video series about the paper mache Pantalone mask (and in my book about making masks, too, of course 🙂 ). 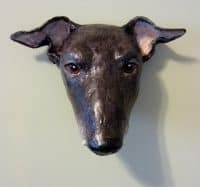 I started out, back in May, making a greyhound skull to use as a form – that worked really well, but I didn’t actually like the mask I ended up with, so I started over. Then I didn’t like the second one either, and started over again. (I learned a lot about making portrait masks during this project!) This last time, I created the form out of Super Sculpey, just like the Pantalone mask in the video. Since I was deep into my house-selling project by then, I didn’t have time to take progress photos. Since my house sold, I’ll probably be spending lots of time in the near future packing books and looking around for my next home. (I think I might end up on the Oregon coast, but I’m still not sure…) However, I do want to try out a new thing I discovered recently – firing earthenware in a Weber barbeque. I have almost 50 pounds of low-fire clay that I bought for my paper mache clay experiments a few months ago, and I think it would be fun to see if this actually works. I’ll keep you posted. In the meantime, take a look at Harry’s mask, and tell me what you think: (Click on the images to make them bigger). Jonni your greyhound is beautiful. I love the eyes , they look so real. I can’t wait to get started on some paper mache. Beautiful. I love the mask. It looks so realistic and has such great expression in the eyes. Well done. I was hoping Zan would post all the finished charity auction final works of art, but I guess we have to hunt for them. Jen Zalewski’s print came out beautifully as well. Would love to see all the others. Ha ha, I knew I carried away, but when I came across that little tidbit, well, I just sent it on to you…. I was thinking of making some kind of animal in flight [dragon or eagle or something, I’m kind of leaning toward owl :P]. Would you recommend a particular way to make the wings? Because I think plain cardboard cut into a wing shape would be kind of straight and flat, and not very realistic. Would I try wire and cardboard? Because it’ll probably need to not sag, and not be five inches thick either. The best armature for your dragon/eagle/something will depend a lot on how big you intend to make it. Flat cardboard really will be flat, as you suggest. You could cut one piece in the shape of the bones, in however position you’d like the wings to be in, and then reinforce the bones with wire that goes from the tip of one wing, across the beast’s back., and to the other tip. Then add feathers made from very thin cardboard or expanded aluminum mesh. A very thin layer of paper mache clay over the feathers will stiffen them and give you the opportunity to add texture. If the wings are really big, the weight will need to be supported with something stronger than wire, rebar perhaps. Forgot to ask about your barbeque revelation! If this idea works you’ll put all the kiln owners of Brooklyn out of commission! So far – after contacting at least three ceramic/kiln businesses, I have been told that I may purchase the clay from them, but they will not fire it or I can purchase the clay from them but they will fire it only on their schedules, and could not be given any indication of how long my finished piece would sit on their shelves waiting for the first firing! I’m guessing that the size of the businesses contacted versus profit factors far outweighed the need to receive new customers, or some such thing. Hi Joanne. Thanks for the invitation. I would love to see Brooklyn, but I doubt I’ll be traveling that far any time soon. And I don’t think I’ll be doing any more sculptures for a while either, until the move has been completed. That would be a wonderful subject for a sculpture, though – Great Danes are beautiful dogs. I haven’t tried the barbeque trick yet. I mixed some paper into my low-fire clay, (it’s supposed to help prevent cracking) and I even bought the briquets. But I haven’t had a moment free to play with it yet. So frustrating! Maybe I’ll take a few minutes off this afternoon to put together something simple that I can used to test the process. It will take a long time to dry, I think, since we’re still having very unusual weather for our part of the country. I think we’re getting all the rain that is supposed to be falling in the Midwest. The barbie trick goes back to the way pots were made before the invention of fancy kilns, so anything they could make 3,000 years ago should work in the barbie. If I didn’t need to paint windows today, I’d be messing around with my clay. I’ll see if my cuz has any pix of her long lost dog – the great dane. Do you still do these mask portraits for charity or for any other purpose? Hi Joanne – I only did Harry as a one-time fundraising event. He was a lot of fun to do, but with all the packing and house-hunting I’ll be doing, I wouldn’t have time to make another one for several months. You might want to collect those photos so you could make a sculpture – I’d love to see how you interpret the big guy. Your sale must have gone thru. Congratulations! I saw in one of your posts that you mentioned climate change. Which triggered something I thought I’d share. Look to the mountains woman for your new home. When I traveled up the coast of Oregon I continually passed signs which stated…”Entering Tsunami Area”…”Leaving Tsunami Area”…for miles and miles. I don’t know if you are aware that another glacier broke free recently…about the size of Manhattan they figure. Since this is appears to be a continuing occurrence, best be safe than not safe. I want you to be safe. Of course, with the ice melting, “upriver” could end up as “beachfront” in a few years. Perhaps that won’t happen in my lifetime. If it does, there will probably be worse things to think about than the tsunami. And today, there’s this one. Different hemisphere, same problem. OK, here’s an important question. Is 58 feet above sea level high enough to avoid a Pacific Coast storm surge or Tsunami? Or the rising sea levels in the next 20 years? How does one look up the answer to a question like that? Well Jonni, According to what I came across http://geology.com/records/biggest-tsunami.shtml was 1724 ft. in 1958. Seems to be the largest tidal wave my search came up with. Visit that site, there is a very short first hand account by 2 survivors. Oh, forgot to mention, looking at the photos on that site, trees and soil were stripped away up to 1720 feet. Lovely dog portrait! Congratulations on the sale of your home – hope you made a huge profit! Care to come to Brooklyn, Not to Live, Visit – just let me know. I remember when I was a kid and I used to visit my mother’s sister, she had a HUGE AND VERY IMPOSINGLY FRIGHTENING, great dane. If you would like to tackle a likeness of him for your charity, please let me know. It will give me a good reason to contact her daughter, my cousin, for some pictures of him. I’ll never forget what a harrowing experience it was to visit them and see this monster looming above me. Hello Xan – yes those danes are scary dogs. Hope to acquire a picture of him for Jonni to model – if she can, We’ll see. You are so talented with eyes. They are the first thing that draws me to a piece. Actually, eyes are what breathes life into it. And you have the gifted talent to do just that. Your Harry makes me want to reach out and pet him! Thanks, Sharon. After working on this piece for so long, I almost feel like I “know” the real Harry. From Nancy’s description of him, he sounds like a very loving, intelligent dog, and that really seems to come through in his photos. Harry is just great, I am sure the people he owns will be so happy with him. Congrats on selling the house, I could say you would like it in Australia, but perhaps a bit far to visit your family, 🙂 also very difficult to buy a house for a decent price here, prices are so very high. Yes, it Australia is a bit far to travel, but if I ever get rich I will definitely visit the country. There are so many wonderful things to see there. Jonni – you’ve outdone yourself again! Harry is just gorgeous! I was just wondering about him last night – so good to see him finished. Congrats on the sale of your house and I hope you find a perfect place for the perfect price wherever you go! I have been so busy with family and my mom who broke her hip recently since you asked me to do a little blurb on my caterpillar – I will try to get to it soon, I promise! That mask is a thing of beauty and the owner of Harry is going to treasure that forever. I hope to aspire to greater things, but now, I live vicariously through the work of others. Yours in particular. Wow! Harry is gorgeous! How wonderful that you’re donating to this event. I understand why you’d miss him. Congrats on selling your house. Good luck with firing the clay in a BBQ. I love how you experiment and are such a perfectionist with your craft! Very inspiring to me! And many others! Hi Melissa. I’m glad you like Harry. This was a fun event, and I’m happy I was asked to participate. But next time, I think I’ll offer something that’s already finished, so the buyer won’t have to wait so long! 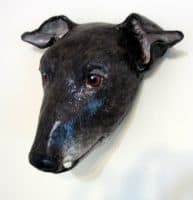 Harry is a thing of beauty, and if you do another greyhound, I’d love to see you make one galloping through the wall — front legs and chest, no furher back than the front elbows? The greyhound looks so elegant running wih the snakelike neck and beautful legs, and then someone could buy him as wall decor as well as fine artl? Congrats on your housing sale, can hardly wait to see where you turn up next! Harry’s mask came out great. I love the blend of whimsy and reality, hitting such a great balance between his tusks and his cuteness. You caught his serious gaze so well! 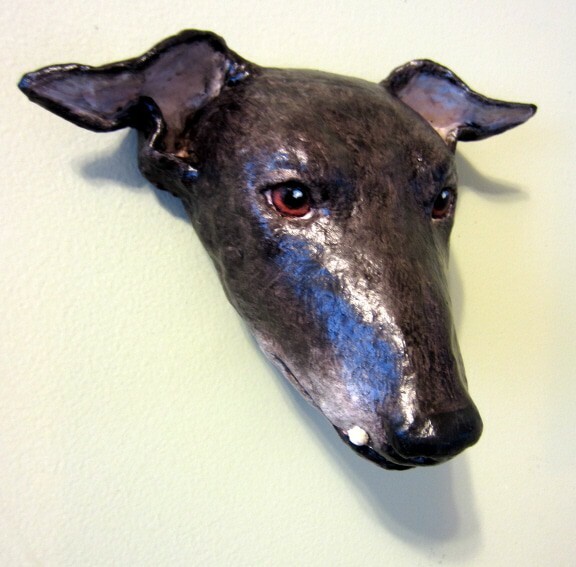 Heh – greyhounds are still alien creatures to me. I think you, Xan, would be the best one to accomplish Patch’s galloping greyhound. Maybe that could be your next project? Oh my goodness Jonni, he’s stunning. I have a back greyhound and he looks so much like him. Beautiful job. I’d love to see photos of your greyhound. Do you have any to share? And is that you kissing a hippo in your avatar photo? What a beautiful pup you have! Ah, a handsome guy you have there! Love the black tuxedo dogs! He’s 7″ long, 9″ from ear to ear, and 3 1/2″ deep. I think this makes him slightly smaller than life-sized.